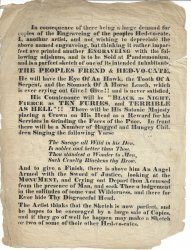 [ 'Promise to pay to Ignorance, Hypocrisy & Fanaticism, Methodist Preachers'. ] Satirical engraving of a bank note, undertaking to pay five farthings 'when Methodism shall have been done away'. 'Sold by Luffman, 377, Strand'.. 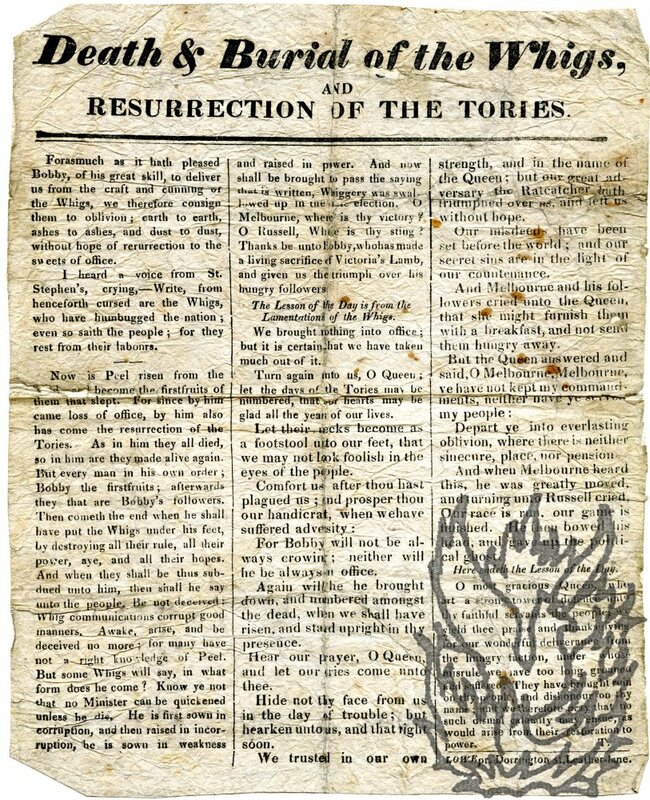 Dated from London, 1 September 1810. Printed in black ink on a 9 x 16.5 cm. piece of paper. A scarce piece of ephemera. Grubby, aged and worn. Laid down on part of a page from an album. A pastiche of a Georgian banknote, the main body of the text reading: 'No. 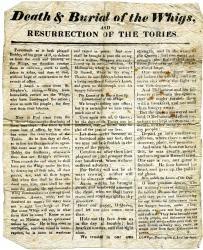 24 . . . . | Promise to pay to Ignorance, Hypocrisy & Fanaticism, Methodist Preachers, or Bearer FIVE Farthings, when Methodism shall have been done away with by the Pious exertions of the established Clergy, and when Iohn Bull's Family shall be no longer scared by the tale of the Devil let loose. | London the 1st. day of Septr 1810. [ 'The Higher Butterfatters' League'; MS. ] Anonymous humorous manuscript poem titled 'Nanette', with illustrations, in praise of the Guernsey cow. 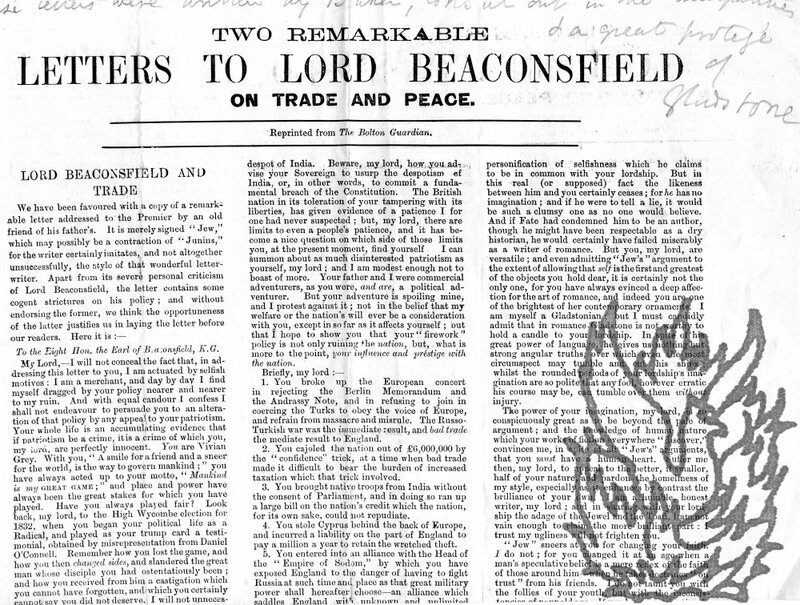 In manuscript, but laid out as a printed book ('A "Guernsey's Own" Publication') said to be 'Specially printed by the "Guernsey Gazette"' and sponsored by the non-existant 'Higher Butterfatters' League'. Undated [ 1950s? ]. 28pp., 4to. Sewn into a booklet, and bound in cream boards, with 'A "Guernsey's Own" Publication' on the front cover, and 'Sponsored by the Higher Butterfatters' League' on the back. There is no indication that the manuscript has been published. It is laid out as a printed book, with title-page (with charming illustration of the smiling cow) and dedication page reading: 'To V, M., the Honorable Patroness of the foster Mothers' Welfare Group, This book is respectfully dedicated.' The poem consists of 36 four-line stanzas, with fifteen charming vignettes. 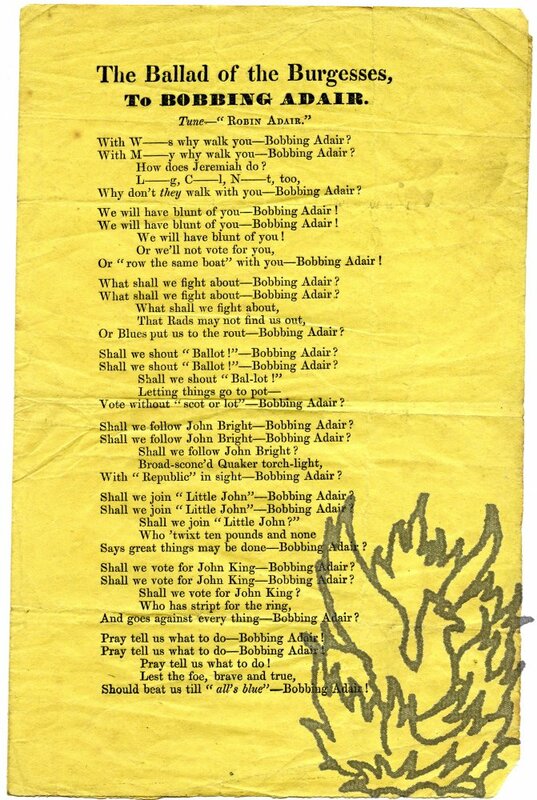 Irish Orange Order political handbill poem, ostensibly by 'Robert Todd, Comber', ridiculing Liberal candidate in North Down John Shaw Brown on his defeat in the General Election of 1885, titled 'The Burial of the Radical Cause in the Glassmoss'. 1p., 12mo. Cheaply printed in small print. A frail survival: aged and worn. In the 1885 General Election Brown was soundly defeated in the North Down constituency by the Conservative candidate Thomas Waring. The present item is headed 'The Burial of the Radical Cause in the Glassmoss. (By Robert Todd, Comber.)' The poem is 32 lines long, divided into eight four-line stanzas. [Douglas William Jerrold, playwright and contributor to Punch.] 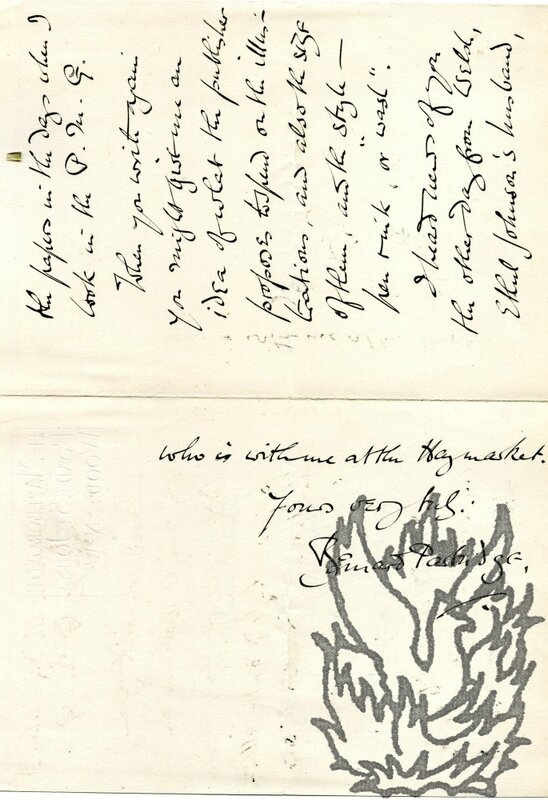 Autograph Note Signed ('Douglas Jerrold') to 'Webster', accepting an invitation in lighthearted style. Putney. 29 November [no year]. 1p., 32mo. Good, on lightly-aged paper. The note reads: 'My dear Webster, | I have fasted all the week in joyful expectation of the 1st of December. | Every truly your's [sic] | Douglas Jerrold'. [Printed offprint from Punch.] The ill-used Homoeopathists. 1p.,12mo. Fifty-three lines of small type. Good, on lightly-aged and ruckled paper, with traces of mount on blank reverse. The item begins: 'MR. PUNCH is accustomed to receive letter and treaties, imploring him not to call homoeopathy fudge, and some of them attempting to assign reasons why he should not. In all these communications, the medical opponents of homoepathy are called "allopathists."' Later on the author comments: 'PROFESSOR HOLLOWAY is perhaps an allopathist; however he does not tell us on what principle his pills and ointments cure all diseases. On letterhead of "Truth" Buildings, Carteret Street, Queen Anne's Gate, London. 25 May 1897. Printed satirical circular 'To the Ratepayers of this Borough', from 'Wm. Buster, Junr. ', concerning his supposed election as a Poor Law Guardian. 1p., 12mo. In small type. On aged and creased paper. 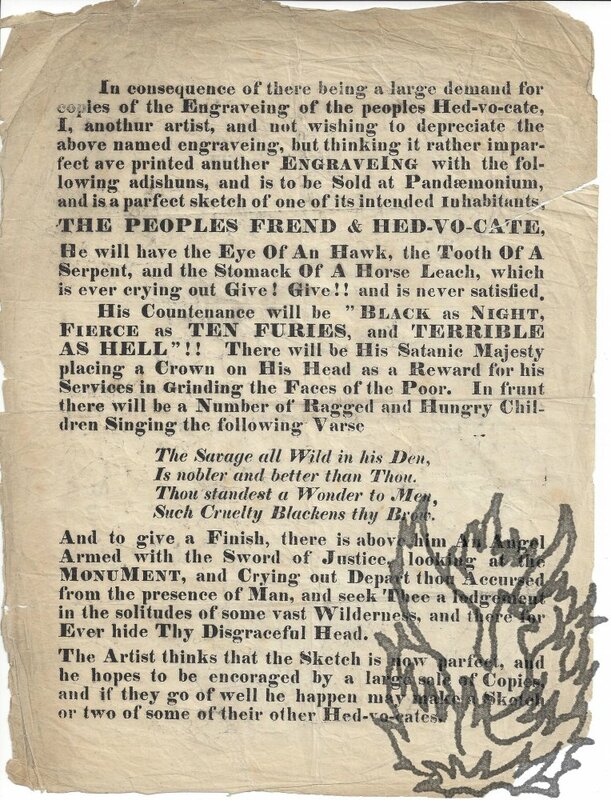 Signed in type: 'Beggar and Flames! | Gentlemen, | If I am not your Bum Bailiffe, [sic] | For any dirty work, | WM. BUSTER, JUNR.' The circumstances surrounding this spoof are unclear. It begins: 'In fact, I feel it a duty devolving upon me, to return you my sincere thanks for the honour you have done me, in electing me one of your Guardians.' The next paragraph concerns 'the slanderous assertion, which certain persons have industriously circulated, detractive of this honour, in fact, that I am the nominee of my own workman'. Dated 'No. 1.] MONDAY, JANUARY 1, 1872. [New Series.' Name of printer not stated. 16mo, 4 pp. Bifolium. Text clear and complete. On aged and creased paper, lightly discoloured. A typographical curiosity, and interesting social document, the background to which is not easily discoverable. 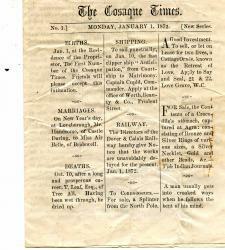 Three columns to a page, with the text divided into short sections including Marriages, Deaths, Shipping and Railways. The first section, 'BIRTHS', reads 'Jan. 1, at the residence of the Proprietor, The First Number of the Cosaque Times. Friends will please accept this intimation.' Spoof advertisements. Folio, 1 p. Double column. Text clear and complete. On aged paper, with wear to edges and repair on reverse to short closed tear. 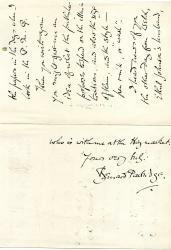 Autograph Letter Signed ('Bernard Partridge.') to 'Miss Smith'. 24 January 1897 ('M.dccc.xc.vij: | jan: xxiv. '); on letterhead of 11 Marlborough Road, St John's Wood, [London] N.W. 12mo, 3 pp. Bifolium. Good, on lightly-aged paper. Attractive red letterhead, in the Arts and Crafts style. The writings she referred to in a previous letter have not come. 'You probably forgot to enclose them. I expect to read some of the papers in the days when I look in the P[all]. M[all]. G[azette].' He asks her to give him 'an idea of what the publisher proposes to spend on the illustrations, and also the size of them, and the style - pen & ink, or "wash".' He has heard news of her 'from Welsh, Ethel Johnson's husband, who is with me at the Haymarket'. In three columns of small type on one side of a piece of unwatermarked wove paper, dimensions 39.5 x 29 cm. Text clear and complete, on aged and lightly creased paper. Four short closed tears at the extremities of folds. An unusual production, docketed in pencil in a contemporary hand at the head: 'These letters were written by Baker, Consul out in the Principalities & a great protege of Gladstone'. 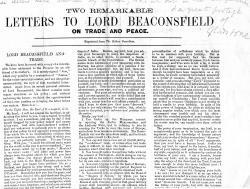 Begins 'We have been favoured with a copy of a remarkable letter addressed to the Premier by an old friend of his father's. Printed on one side of a piece of laid paper roughly 21 x 13.5 cm. Good, on aged and lightly-creased and spotted paper. Eighteen line poem in heroic couplets, turning on the conceit of a game of cards. Begins 'OFT have I shuffled, often played the Knave, | In vain attempts a losing game to save;'. Ends ' 'Stop!' cried John Bull, with honest anger choking; | 'Turn out that fellow Gladstone - he's revoking!' ' References to Egypt and Home Rule date this item to the mid eighteen-eighties. Printed in three columns of small type on one side of a piece of wove paper roughly 22.5 x 18 cm. Text clear and complete on grubby, worn, creased and foxed paper. Two pages, printed on the recto of the first leaf and verso of the second of a yellow wove-paper bifolium. Leaf dimensions 22.5 x 14.5 cm. Grubby and creased, but with text clear and complete. The first poem, 'A New W[h]ig Song', begins 'In our town there's a street, with a chapel and shop, | Where a gay pole once hoisted of late is let drop, | There a fam'd Barber deals with his w(h)ig as he wills, | From full bottom'd P----r to little scratch M--ls.' References to 'shot-yellow A---r [Adair]' and 'M----y, the close button'd Barber'. Landscape 8vo (leaf dimensions roughly 15.5 x 23.5 cm): [iv] + 98 pp of letterpress, and 24 tipped-in full-page lithographic engravings ('taille-douce' over a tinted background), one illustrating each of the book's twenty-four chapters. Woodcut engraving on title-page. In contemporary brown cloth with green patterned endpapers. A tight copy, with the first few leaves somewhat grubby and worn at bottom outer corners. Occasional foxing throughout. Alhoy (1802-1856) was co-founder of 'Le Figaro'. Second and last edition. The Rival Houses of the Hobbs and Dobbs: or, Dress-Makers & Dress-Wearers. By Crotchet Crayon. 12mo, [ii] + 235 pp. In contemporary brown-calf half-binding, with marbled boards and grey endpapers. Internally sound and tight, if a little foxed, with some wear to the extremities of the title-leaf. In worn binding with label on spine mostly worn away. The identity of the author is unknown. The conference. 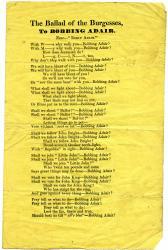 Instructions given to Sir Robert Ladbroke, Knt. William Beckford, Esq; the Right Hon. Thomas Harley, Esq; and Barlow Trecothick, Esq; representatives of the City of London: by their constituents. Printed on one side only of a piece of watermarked laid paper, dimensions 32.5 x 19.5 cm. Folded twice for insertion in the magazine. Good, apart from strip of approximately 0.5 x 5.5 cm loss along top fold, affecting one word of text, and neatly repaired with archival tape. At head of page clean impression of satirical engraving (roughly 8.5 x 13 cm), showing Beckford (father of the connoisseur), in Lord Mayor's robes, telling Harley to 'Receive Instructions & not Silver'. Harley, holding a jacket, tailor's iron and shears, replies 'Teach us our Lesson! Are we then School Boys? Unsigned coloured caricature of the Duke of Wellington, entitled 'The Hampshire Hog, or the Virtuous General retreating from his Position'. 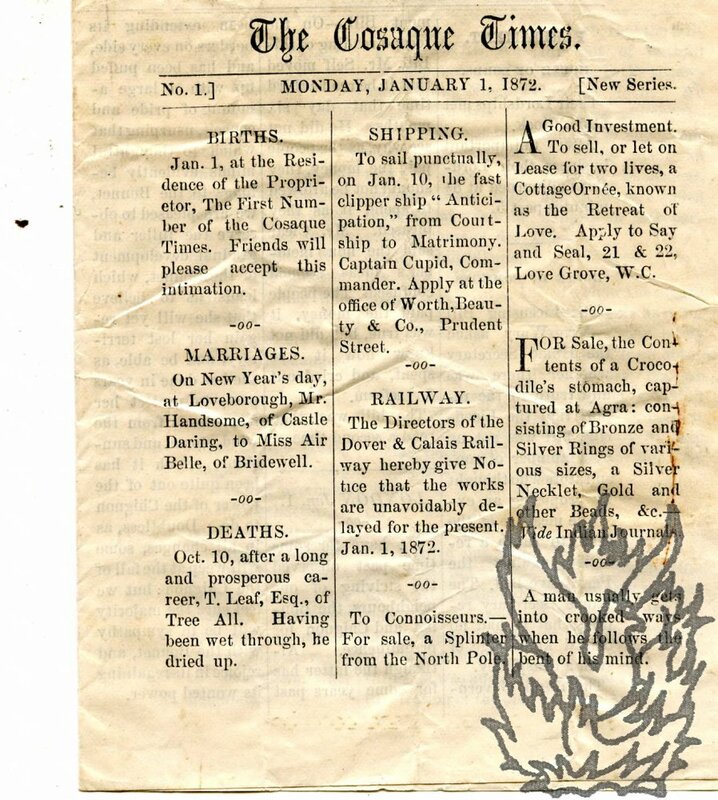 Pub Jan. 29 1821 by S W Fores 41 Piccadilly'. NOT in George. Dimensions of paper 27.5 x 41 cm. Dimensions of image 20.5 x 31.5. On aged, grubby paper with wear to extremities. Image entire, but with one closed tear intruding from right across 3 cm of the blue background, and three closed tears (the longest 4cm) horizontally across a central vertical crease. A splendid full-length figure of Wellington (entirely undamaged), in full military uniform, with boots, red coat with gold epaulettes, white breeches, gloves, and sword, flees, hands in air and plumed hat falling to the ground, from a giant pig with three human heads. Historic Certainties respecting the Early History of America, developed in a Critical Examination of the Book of the Chronicles of the Land of Ecnarf. 8vo: [viii] + 62 + [ii] pp. Good, though a little dogeared and discoloured, with slight wear at foot of final leaf. Half-title (with quotation from Strauss's 'Leben Jesu' on reverse) and (discoloured) final leaf of publisher's advertisements. Disbound. The author is described on the title-page as ''Rev. Aristarchus Newlight, Phil. Dr. of the University of Giessen; Corresponding Member of the Theophilanthropic and Pantisocratical Societies of Leipsig; Late Professor of All Religions in several distinguished Academies at home and abroad, etc. etc. Autograph note signed to unnamed female correspondent. English illustrator (1876-1953), best-known for his work in 'Punch'. One page, 12mo. Very good. Folded once, and with one closed tear in crease. 'Many thanks for the good wishes and the horse shoe'. Signed 'Frank Reynolds'. Docketed in ink on reverse. Burnand (1836-1917) was editor of Punch between 1836 and 1917. Paper dimensions roughly 4 1/2 inches by 2 1/2 inches. In good conditon. Reads '<...> with you | faithfully | F. C. Burnand'. On verso '<...> be most <?> & happy & ought to get on well with his purser a straightforward <?> & gentlemanly <...>. 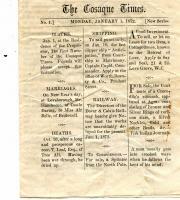 Without date or place, but circa 1834; printed by 'BIRT, Printer, 39, Great St. An- | drew St. Seven Dials. [London]'. In 3 columns on a sheet of thin unwatermarked wove paper, 10 inches by 7. Creased and grubby, but in good condition overall. Lightly attached at head to a sheet of paper. Satirical report of examination of a Beadle, Bob Orange Peel [Sir Robert Peel], Old Nosey [Wellington? ], Cumberland Griffin from Kew [? ], Jack Cobley [? ], Winchester Rat (a mayor) [? ], Sailor Bill [William IV], and Madame Addle-head [? ].